Greetings, friends! Looking at these pics, I should have saved this outfit for a second installment of Week of Vintage, but I have a fair amount of new springy/summery vintage dresses so I'll postpone it for now. 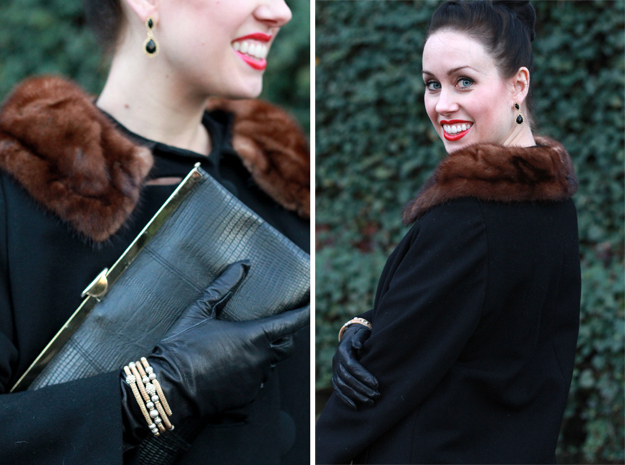 I'm excited to share this 1950s/60s swing coat with you. I actually found it last summer in an antique shop on my first trip to South Florida. There was a booth of probably at least 30 of these coats and I think I tried on every single one searching for the right size. They were a little bit out of my price range at the time and I decided to wait on the purchase. When I returned to South Florida over Thanksgiving break, I wanted to stop in again to see if they still had this coat. Lucky me - they still had this exact one and all the coats were on sale so I snatched it up (really, who buys fur collar wool coats in South Florida?)! It looks practically brand new - there's no wear on it and the pockets were sewn shut. I wonder if the coat was 'new old stock', meaning a vintage item that's never been worn. There are no inside labels other than a small Union Label. Regardless, I love it and I think it's a great vintage buy! 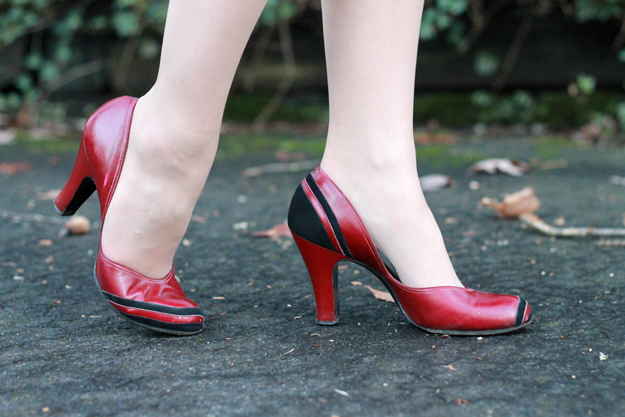 I'm also excited to show you one of my favorite pairs of vintage heels. I purchased these almost ten years ago on eBay. They were exactly what I was looking for at the time - thicker heel, roundish toe, curvy sides, and a fun color. Have a wonderful week and thank you so much for visiting today! Love your look darling!! It's so MAD MEN style!! I don't know how far back your vintage knowledge goes, but I am going to a 1920s party in March. I have a beautiful beaded dress, but I'm struggling to find vintage-style shoes. Any pointers? It looks beautiful <3 Love the heels too!!! you look so elegant and ur style is always so timeless. xO! What a beautiful coat! A great find! These are such classic pieces. Love the vintage coat! The fur on the coat looks so wonderful vintage and the heels too! Love this all over vintage outfit! As beautiful as always! That coat is the absolute perfect shape. So lady-like! You look great! I really love those old vintage coats in that style. I just came across your blog on Bloglovin and I'm so glad I did. I am a huge fan of vintage style. I'm following you now. WOW! It was fate that this coat would be yours! it's really beautiful and I know you'll put it to good use. that coat makes such a statement! i love the fur collar. you look so regal!